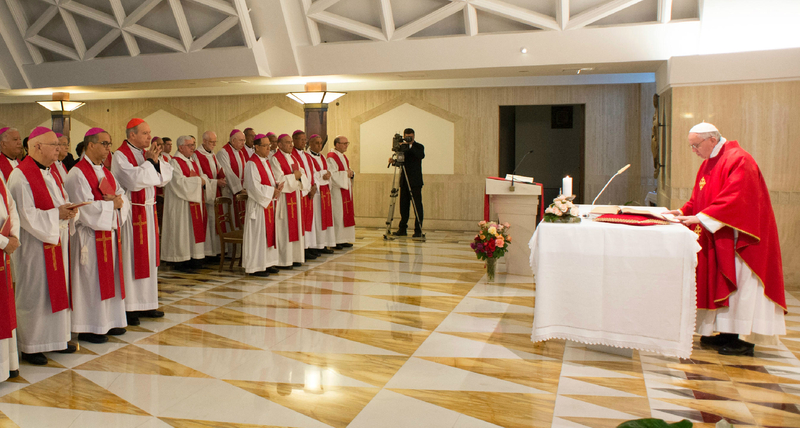 This was the reflection given by Pope Francis during his morning Mass at Casa Santa Marta today. The Holy Father reflected on today’s Gospel from St. Mark, in which Jesus tells the parable of the vineyard owner’s son who was killed by the tenants when trying to obtain the fruits of the vineyard. “Have you not read this Scripture passage: ‘The stone that the builders rejected has become the cornerstone; by the Lord has this been done, and it is wonderful in our eyes?’” Jesus says. The Pope said that while the story seems to be a failure, it is in fact of history of love between God and his people. Recalling Jesus’ parable, the Holy Father said that it is precisely in that death where everyone finds life. The 78 year old Pontiff said that the Bible contains countless events in history that show God’s love, despite the disobedience and rebelliousness of his people. The Pope called on the faithful to not forget this difficult path by examining one’s conscience.